Sometimes it is not possible to pack up an entire school or even grade level and take them on a camping adventure. Issues like transportation, volunteers, time, tests and a million other factors can be barriers to schools creating opportunities for their students to have a camp out. So why not host a School Yard Campout! Camping on the campus is a great way to introduce students and their families to camping and outdoor skills in a safe, community engaging atmosphere. Hosting a school yard campout might be a fun way to reward a class for high achievement, or simply use it as a tool to gain greater family participation with school events. Either way it is a perfect activity to help kids build self-confidence and self-reliance while learning important outdoor skills. A recent study Don't Forget the Families, The Missing Piece of America's Effort to Help All Children Succeed, investigates the importance of including parents and caring adults in the learning process in school, after school and during summer programs. There are many ways to organize a campout, but here are some tips and resources that can help have a successful event. Schools can ask for community support through donating tents, sleeping bags, sleeping pads, flashlights, and other supplies. If these things are donated, the school can create a gear library that can be used in years to come. Schools can seek funding for the event through local grants or business that would help purchase gear. Schools can require families provide their own gear if they want to participate. This might limit participation, but it also is a means to encourage families to continue to camp on their own. Planning where to pitch the tents chose a flat, open area free of fire ants. Provide access to school or sports field’s bathrooms or rent port-a-pottys. If possible have the camping area be away from a major road, traffic and traffic noise. Make sure the in-ground sprinkler system is turned off during the event! Some schools may wish to have an on-site security guard available. Lighting is good, but when it comes time to camp too much light can result in a sleepless night. Not to mention it will block out the night sky. When the families are included that creates a safer environment than just hosting kids with a few chaperones. Build in some structure that will create a safe environment such as; quiet time, lights out time, arrival and departure times, and host planned activities. If the campout is for kids only, consider having some sort of family ceremony at the end of the campout that also serves as a defined pick up time. Consider having a flashlight game or circle if a campfire is not an option. Cooking out is an important part of the outdoor experience. Consider engaging the community businesses with providing a lunch or dinner that is cooked on site. Pot lucks are another great way to engage families and encourage cooperation for at least one meal. S'mores are a fun treat that everyone can make together. There are also lots of great healthy alternatives ideas on Pinterest. Cooking is a great way to celebrate cultural diversity in the community. Hosting a campout can be a good time to partner with organizations that can provide technical support or lessons the day of the campout. For example: Volunteer Angler Instructor, Game Wardens, Buffalo Soldiers, FFA or 4-H, Texas Wildlife Association, Leave No Trace - volunteer trainer, Scout Leaders. Create a service learning project that goes with the campout to improve the school grounds, creates awareness or let the campout be the culmination event for a school project. Consider having some awards or recognition ceremony at the end of the campout to thank businesses and highlight kids or families who went above and beyond in a skill or service. Plan for structured games or lessons that help kids and families build skills such as: properly setting up a tent, setting up a good camp kitchen, or learning how to use a GPS for a geocaching adventure. Help families understand what they will hear and can expect at night. This will help alleviate fears so they can relax and have fun. Plan for free time for kids and families to engage with one another, play and explore. The National Wildlife Federation celebrates camping in June with the Great American Campout. They have some good resources and ideas on their website as well. 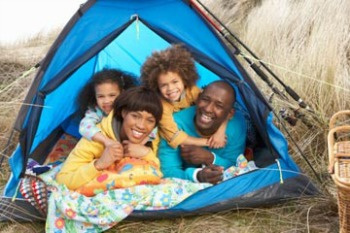 Once the school campout is over, families can find places to explore in nature at NatureRocksTexas.org.